Believe it or not, all of our ancestors wore brain-tanned buckskin. From primitive, hunter-gatherers to the early American pioneers, buckskin was a universal material for clothing, rope, footwear, etc. 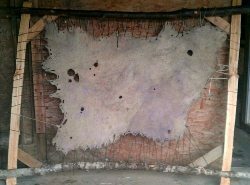 In this three day course you will learn to transform a raw, somewhat unappealing deerskin into soft, luxurious buckskin. Over three days we will scrape the skins clean, soak them in a bucking solution, rinse them, soak them in a brain solution and stretch them until they are soft and dry. Finally we will smoke the skins, turning them golden brown and preserving them as buckskin. Katie Russell skinned her first squirrel at age six, and has been in love with dead things ever since! She loves the alchemy of transforming a stinky wet mass of skin and hair into luscious, durable, sustainable buckskin. 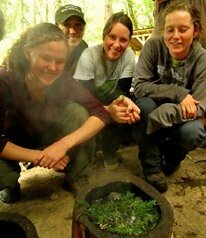 A 2007 alumni of the Living Wild School with Lynx Vilden, she has gone on to lead internships in animal processing, deer skinning, brain-tanning, and buckskin clothes-making. 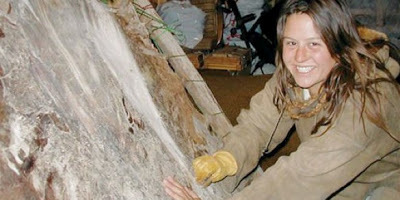 Katie started www.Wilderbabe.com, where she sells her raw skins and custom work. She also runs primitive skills day camps for kids and organizes Saskatoon Circle Gathering (www.saskatooncircle.com). Katie is based in Twisp, Washington where she lives with her beloved horse and donkey. "Course was excellent. The instructor was very knowledgeable, easy to understand, and broke everything down to easy to follow steps."